Do You Know the Truth About Income Taxes? Reveals that the payment of "Income Taxes" is VOLUNTARY, not mandatory. Proves that the IRS does NOT have the authority to collect "Income Taxes" from you. Is an affordable, easy-to-understand exposé of the TRUTH about the "Income Tax." How the IRS has TRICKED most Americans into paying "Income Taxes." What the "Income Tax" laws REALLY say and why they don’t apply to you. What deception and FRAUD the IRS must use to take your money and property. CHAPTER 1: THE TRUTH ABOUT THE "INCOME TAX"
The bottom line is that we have been TRICKED into paying "Income Taxes." Through a web of lies and media propaganda, we have all been led to believe the law obligates each and every one of us earning a paycheck to hand over a sizable portion of our hard-earned cash. But the truth is that the law requires only a very small minority of individuals -- those working in occupations having to do with alcohol, tobacco, firearms, hazardous fuels & chemicals, and the like -- to pay income taxes. Everyone else has been TRICKED into paying them. The proof of this is in the Constitution, and Chapter 1 gives this proof, highlighting the provisions that prohibit the sort of "Income Tax" that most Americans pay, and citing the court cases which debunk the myth that the 16th Amendment provided for this form of "Income Tax." Along with the myth that everyone is subject to the "Income Tax," Americans have also been led to believe that their "Income Taxes" pay for the operation of, and services provided by, the federal government. Thus, most good-hearted Americans feel a patriotic obligation to pay taxes on their earnings. But the fact is that not one nickel of our personal "Income Taxes" pays for the operation or services of the government. The truth is that the "Income Tax" was designed for one purpose only, and that was to pay the interest on the federal debt. And that's all it does. "But," you say, "aren't we obligated to pay the interest on that debt? After all, we owe that money, don't we?" Here's where the story gets really interesting. The federal debt is a fraud that has been created virtually "out of nothing" by the Federal Reserve -- a private banking organization that masquerades as a government agency -- for the purpose of further enriching the ultra rich. It does this by charging interest on credit literally created out of thin air. Sound preposterous? These claims are documented in Chapter 2 with official quotations that you can obtain yourself if you wish verification. The fact that these claims sound so utterly preposterous is what allows them to be so easily dismissed by the American populace, and what allows the Federal Reserve to continue its fraudulent control over our economy. All right, now that you know you're neither legally nor patriotically obligated to pay taxes on your earnings, you may be wondering why the IRS is able to prosecute people for failing to file "their taxes." The accounts you see in the news media sure make it seem as though you're legally obligated to pay "Income Taxes," despite the prohibitions found in the Constitution against this form of tax. The truth is almost inconceivable to those who have not studied it. Congress has exploited a flaw in the Constitution to enact "Income Tax laws" for citizens of the District of Columbia, then tricked Americans into unknowingly renouncing their native state Citizenship and adopting this "federal" citizenship. As "federal citizens," then, these Americans are now legally obligated to pay "Income Taxes" even though they actually live and work in one of the states of the union, not in the District of Columbia. Don’t remember this happening to you? Can’t think of how you might have renounced your native state Citizenship and adopted "federal citizenship?" Well, it happened when you got your Social Security Number. Chapter 3 lays bare this nefarious and carefully hidden scheme, and explains the exact mechanism by which Congress has tricked the vast majority of Americans into accepting this "federal citizenship" and unknowingly obligating themselves to pay "Income Taxes" they would not otherwise be liable for. Once you understand this, it becomes obvious that the only weapon the IRS has against you is your own fear and ignorance. As the very foundation of the "Income Tax" is a fraud, so are many of the tactics used by the IRS to collect "taxes" that are not legitimately owed. For instance, did you know the "Income Tax" is voluntary? You wouldn't know it by the way the IRS phrases their instructional materials. And on the "Notice of Levy" the IRS uses to inform "delinquent taxpayers" that their wages and bank accounts will be levied, this organization even goes so far as to leave off the paragraph of the Internal Revenue Code which provides for levies ONLY on federal employees, not private citizens. Chapter 4 lists five mind-boggling examples of IRS fraud. All right, after learning that the Constitution prohibits taxation of earnings in the 50 states and that the "Income Tax laws" apply only to citizens of the District of Columbia and that the IRS's only weapon against you is your own fear and ignorance, is it going to turn out that you're STILL stuck in "The system" with no way out? Nope. The foundation for the way out of "The System" is the fact that you were drawn into it by fraud. In law, fraud automatically nullifies all contracts, and that would include the agreement you made to be a "federal citizen" and pay "Income Taxes." Numerous publications are available for more detailed information on this subject and the Appendix lists a number of them, along with ordering information, and several resources for Patriot services. I Wrote The Great American Income Tax Ripoff because 40 bucks is too much for most people to pay just to find out if they want to learn the truth about the "income tax." That’s what most of the other books on this subject cost. I’m a professional writer who became a Patriot and discovered the need for a low-cost, reader-friendly book that fits the myriad of facts into a big picture so you can clearly see your relationship to the income tax, the IRS, the Federal Government, and the Constitution. 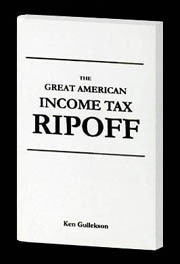 My book costs only $10 so you can learn the truth about the income tax without the big expense. And if you already know the truth, you can share it with your friends and family by giving them copies of my book without breaking the bank. After reading The Great American Income Tax Ripoff you’ll really understand why you’re not subject to the income tax.